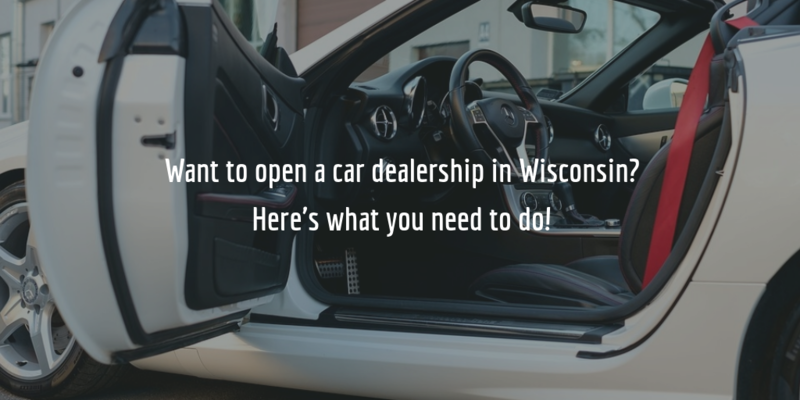 To open your own car dealership in Wisconsin or to sell cars to retail dealers, you need to obtain a Wisconsin dealer license from the state Department of Motor Vehicles (DMV). To qualify for a license, you will need to complete certain pre-licensing requirements, such as to obtain a Wisconsin auto dealer bond, have a zoning permit and others. See below for a full explanation of the qualification criteria and the licensing requirements for the Wisconsin dealer license. Once dealers have complied with the qualification requirements for obtaining their Wisconsin dealer license, they can proceed with applying at the Wisconsin DMV for their license. Here is what dealers will need to provide when applying for their business license. To apply for their license, applicants for retail or wholesale dealer licenses must complete a number of forms provided by the DMV. Finally, both retailers and wholesalers can submit the Buyer’s license application (MV2941), and the Salvage Buyer Identification (BID) Card Application (MV2651). Both of these are optional and depend on whether the applicant wants to receive the right to bid at auctions or motor vehicle salvage pools. Once you’ve completed all of the above forms, you need to submit them to the Wisconsin DMV for processing. If there are no issues with your application, and you’ve covered all the qualification criteria, you will be issued your dealer license. Licenses are issued for a period of two years and must be renewed, along with the surety bond, before they expire. the Wisconsin Department of Transportation (WisDOT) Dealer & Agent Section typically contacts licensees two months prior to their license expiration date with all the relevant materials and instructions needed to renew the license. Without getting a dealer bond applicants for a dealer license can’t proceed with the licensing process. The surety bond requirement is essential for licensing because it serves as a type of guarantee for the state and the public. The guarantee it extends is that dealers who have gotten bonded will comply with the terms of Chapter 218 of the Wisconsin Statutes. If a dealer should violate these terms, and cause their customers or the state any damages or losses, a claim can be filed against their bond, and claimants are compensated by the surety. To get your bond, you need to pay a bond premium, and not the whole bond amount, as is sometimes mistakenly thought. The bond premium or bond cost is a small percentage of the total bond amount. It is determined by the surety company which issues and backs your bond when you apply for the bond. The surety takes your personal credit score as well as other financial indicators into consideration when setting a rate on your bond. Typically, applicants with high credit scores are offered the lowest rates – between 1% and 3% of the total bond amount. To get a free quote on your Wisconsin auto dealer bond, complete our online surety bond application form and we will shortly contact you with your quote. If you have any questions regarding the bonding requirements for Wisconsin auto dealers, give us a call at 866.450.3412 to speak to our surety experts!